Approximately 47,750 people will be diagnosed with oral cancer this year in the U.S. An estimated 7,500 people will die of these cancers. Fortunately, the death rate has decreased in the last 30 years. However, the scope of the problem is increasing, with new cases exceeding 450,000 worldwide annually. 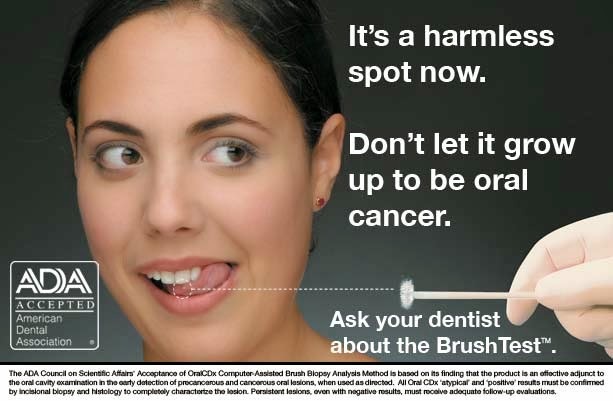 As April is oral cancer awareness month we would like to highlight the importance of getting screened. Also, we would like to examine the risk factors associated with this type of cancer. Some people have fewer risks than others, but may still develop oral cancer, therefore it is important to schedule regular checkups with your dentist and physician. Tobacco products cause about 75 percent of oral cancers affecting the mouth, tongue, lips, throat, and parts of the nose and larynx. Smokeless tobacco carries even greater risks. You have a 50 percent higher risk of developing oral cancer with long-term use of smokeless tobacco. One can of smokeless tobacco delivers as much nicotine as 60 cigarettes. Alcohol also increases the risk of developing an oral cavity and oropharyngeal cancers; about seven out of 10 patients with oral cancer are heavy consumers of alcohol. The leading cause of oropharyngeal cancer is HPV, but a small number of oral cavity cancers also occur from HPV. People with oral cancers linked to HPV tend to be younger and are less likely to be smokers and drinkers, however; smoking increases the risk of oral HPV infection. Oral cancers are about twice as common in men. The recent rise in HPV-linked cancers has been predominantly found in younger males, therefore this trend will likely continue. While these risk factors are the most common correlation to the disease there are a whole host of other factors including: poor nutrition, long periods of exposure to UV light, genetic syndromes and a weakened immune system. Schedule a screening: contact your dental office and book an appointment, encourage friends and family to do the same. Hold an event at your workplace: schedule a time period where walk-ins and appointments are welcome. Coordinate with the benefits provider/H.R. manager at your workplace to get the message out to the staff members. Host a public event: OCF provides a list of resources and tips on their website to help you plan and market the details of your event. Artistic Dental is your partner in care and we are happy to address any concerns or questions you may have. Call to schedule a consult today.